Portsmouth missed the chance to go back into the automatic promotion places as AFC Wimbledon earned a deserved draw. There was barely a chance in a scrappy game lacking quality and excitement, with the best opening falling to the hosts after the break when Marc McNulty forced a decent save from Ben Wilson. The pace and power of Ade Azeez was the most likely source of an away goal. But he hit the outside of the post from a tight angle with their best chance just before the interval. 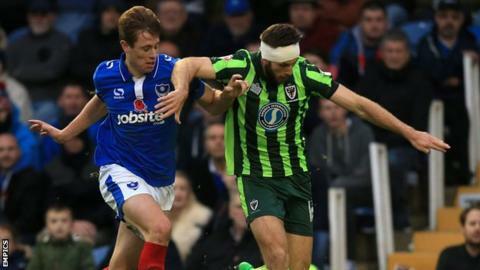 Pompey, who go up a place to fourth in the League Two table despite their fourth game without a win, were booed off at the end as the Dons held on with limited trouble to move up to ninth. Match ends, Portsmouth 0, AFC Wimbledon 0. Second Half ends, Portsmouth 0, AFC Wimbledon 0. Corner, AFC Wimbledon. Conceded by Nigel Atangana. Corner, AFC Wimbledon. Conceded by Matthew Clarke. Corner, Portsmouth. Conceded by Jonathan Meades. Corner, AFC Wimbledon. Conceded by Adam Webster. Attempt missed. Kyle Bennett (Portsmouth) right footed shot from the centre of the box is just a bit too high. Substitution, AFC Wimbledon. Callum Kennedy replaces Sean Rigg. Hand ball by Barry Fuller (AFC Wimbledon). Substitution, Portsmouth. Nigel Atangana replaces Caolan Lavery. Corner, Portsmouth. Conceded by Karleigh Osborne. Attempt missed. Christian Burgess (Portsmouth) header from the centre of the box is close, but misses to the left. Substitution, Portsmouth. Kyle Bennett replaces Adam McGurk. Marc McNulty (Portsmouth) wins a free kick in the defensive half. Corner, Portsmouth. Conceded by George Francomb. Substitution, Portsmouth. Matthew Clarke replaces Gareth Evans. Attempt missed. Paul Robinson (AFC Wimbledon) header from the centre of the box is just a bit too high. Foul by Marc McNulty (Portsmouth). Corner, Portsmouth. Conceded by Ben Wilson. Attempt saved. Marc McNulty (Portsmouth) right footed shot from the centre of the box is saved in the bottom right corner. Second Half begins Portsmouth 0, AFC Wimbledon 0. First Half ends, Portsmouth 0, AFC Wimbledon 0.